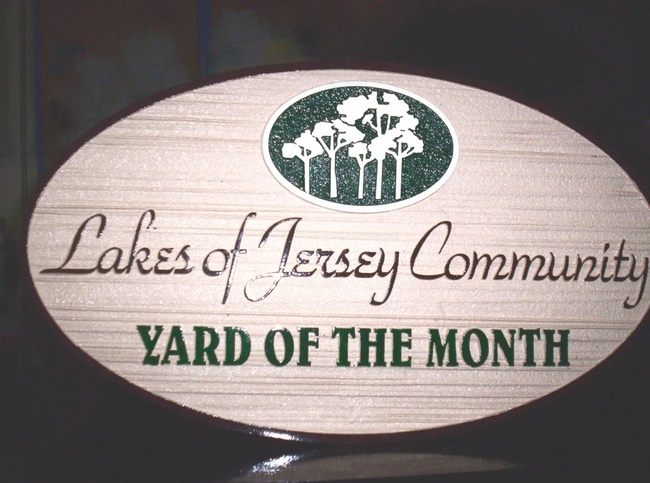 This custom carved 2.5-D High-Density-Urethane (HDU) Yard-of-the-Month sign uses the very popular art of a grove of deciduous trees. It is sandblasted HDU with a wood grain texture background. After hand-painting with bright long-lasting automotive-type enamels, this plaque is clear-coated twice. It is UV protected and waterproof. This sign can be purchased with a steel stake that can be easily inserted (it has a foot pedal) and removed in the ground for easy movement from one yard to another. To see many photos and designs of over 30 other Yard-of-the-Month and Home-of-Month signs in Gallery 19B, click on "Return to List>>" below right. We make custom & personalized elliptical, decorative, and other shape long-lasting and beautiful wooden and HDU Yard-of-the-Month or Home-of-the-Month signs complete with wrought iron stakes that can be easily moved from one property to another. We can make a 2.5D or 3D ) custom carved wood or HDU wall plaque of any design in any size from 18 inches to 36 inches, for all-weather outdoor use. Any sign can use a wide selection of color, font style, and artwork choices.